Have you ever seen an older man handle a baseball? His hands are wrinkled and weathered almost to leather—the kind of man who played baseball in his younger years stayed outside sans lotion through his 60s. He gently rotates the sphere in his hand seamlessly moving to his favorite pitches: some spin to the two-seam fastball others to the four-seam fastball. Junkball pitchers slide to their finger position for a curve or drop ball. He had a short-term infatuation with a knuckleball, and remembers the heartache of the pitch. His hands are gentle with the toy, neither crushing it nor letting it fall. His wrists become light, rocking the ball back and forth as he mimics releasing a pitch. His hands caress the ball like a young lover's breast. His eyes, with his heart, look into the sphere like Adam looks at the gates of Eden. His thoughts cycle through his memories with his father, his friends, and his arch-nemesis. Every game is remembered; every homerun was proud jog around the bases; every strikeout pitch is enjoyed. Then, he recollects his eviction from the game. The day life took over and he had to quit, by his choice or not, the game he'd loved. The day he started having pain in his elbow, the day someone was a better hitter, the day he started working in a steel mill, his 1st year anniversary with his wife, or the birth of his second child. Remembering that breakup with baseball is emotional enough for him to hand the ball to a child. TL;DR ivory tower speak: Because people are naturally power seeking, flat organizations can turn to anarchy when people play in all swim lanes of power. Employees at flat companies enable action through persuasion. Traditional corporations, based on authority, used coercion (you will pull this lever, and I will pay you a dollar). But, persuasion can be an interesting beast, and is not as simple as choosing the right path. Technology companies have enough different paths to success and the chosen path becomes a political choice more than a practical choice. What programming language? What database platform? How much to spend on servers? What features to build? Who to hire? Who to fire? Traditional organizations have a single person being the tiebreaker or vetoer for these decisions. Flat organizations don't have the judge, so employees must play to the jury. We aren't talking about black and white answers–we are talking about choosing between two choices that are both 7's on a scale of 1 to 10. If all choices are between better than average and less than stellar choices, persuasion is no longer based on knowledge and ability. Persuasion becomes about preference. Preferences are skewed by relationships. With the flat organization, you have access to more people to persuade. Everyone is a both a manager and the bottom of the ladder. There are no roles to assume, such as leader of a team or manager of a product. Roles at traditional organizations subtly manipulate and motivate people to act the way to company needs them to act. Flat organizations, since they don't have granted roles and authority, enable employees to seek alternate means of power, unless held in check. Traditional organizations skew heavily toward authority by creating roles. An assumption of a role by an employee allows them to compartmentalize the other Social, Knowledge & Ability, and Physical power swim lanes. The issue with traditional organizations is the questioning of a person's source of authority (i.e. nepotism or friendship). But, the person with authority has authority, until he doesn't. Flat organizations are not equipped with roles to assume. 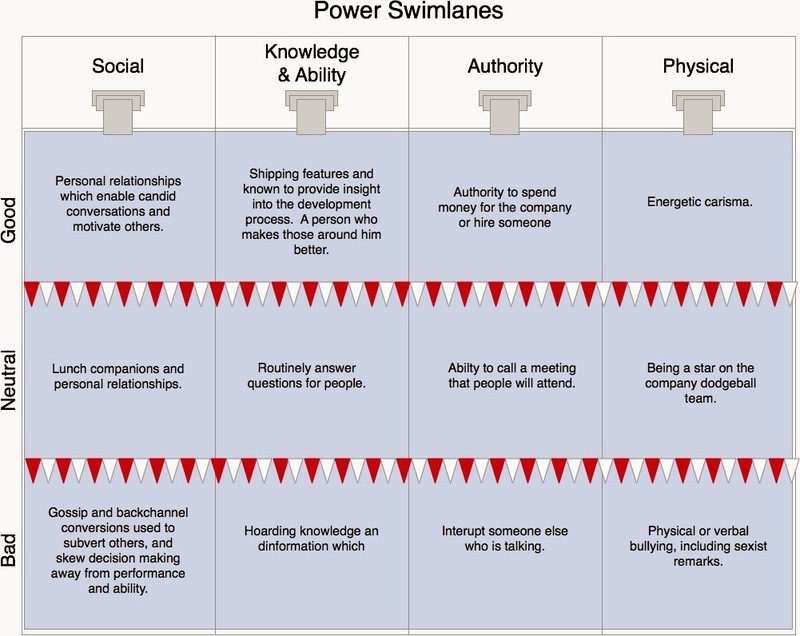 Flat organizations require people to play in each of the swim lanes of power. If a person cannot find the power he seeks in Knowledge and Authority, and feels frustrated, there are two options: either follow or resort to other channels. For sick, flat organizations, dysfunctional power structures exist, and have their origins in the beginning of the organization. Those jokes and conversations that were in private between founders manifest themselves into company cultures. Unhealthy flat organizations have all of the sources of power in play. People use relationships, backchannels, verbal bullying, and disturbing others who are talking to maintain power. These are used to extol power of people, and thus bend to decisions. Sick flat organizations convert from meritocracies to oligarchies. Healthy flat structures are the other end of the spectrum. They consist of people who hold values above power. The few people that hold authority in a flat organization abhor the dysfunctional swim lanes and raise up people who pursue quality. Healthy flat structures are against human nature. It means you have to find people who are mature enough to forgo their thirst for power unhealthy regions. Then, promote a mature environment to reinforces good choices. Choosing a flat organization is a choice to rise above the standard. Cliques in high school are an organizational structure to rise above the flat structure of high school. As a company leader, you have to rise above the anarchy and inject proper values into the system. Many of the popular incentivization programs for students look for positive grades. However, grades are an outcome, and outcome measurement is too late. Think of incentives on grades as dividing the output of a production line into two buckets: the outputs that match standards and those that deviate. Schools measure these because they traditional, easy, and accessible. Every student receives grades for every course, thus the data is accessible, and schools do not have to build anything new. Schools should stop measuring student outcomes and start measuring student inputs. Institutions should institute thin slicing student educational participation. When we measure student inputs, we are measuring the discipline of students to take charge of self-education. What inputs should schools measure? The above inputs do not predict success ; I use the term "Actions Indicative of Success." Students can fail when doing any of the above. However, I have friends who failed college courses while pursuing the actions above, and they are much more successful than friends I know who flew through college. Silently, marching, billowing from tall stacks, assembling energy. All the while, the maniacs build. Neither heeding rivers nor forests, the war march is steady. News travels by wire of the sieges. Attacking the war-machines at their power. No light escapes night's chilling power. I flogged the Alabama Accountability Act a few days ago, and I've been turning it over in my head. If I was to vote on it today, I would vote "no". However, I am coming around to the idea of the act. The reason I like the act: it gives a framework for starting an independent school in Alabama. And 1000s more sites with online training, exercises and more. With the online courses, a school could teach students to take charge of their education. This school could also focus on partnering with local businesses to bring back apprenticeships. Imagine the value of a school that delivered 4-hours per day of structured liberal arts training paired with practical real world apprenticeship programs. Anyone willing to take this risk, would know the budget would guarantee: $3,500 / student / year. Optimizing student improvement per dollar spent would be a good metric to start building an innovative education platform. The shortsightedness of Del Marsh's summary of the "Alabama Accountability Act" misses many major points about the economics of education in Alabama. In fact, he speaks of Alabama Education like he does not know the past, like he is an alien who landed on a planet looking to solve a problem. The "Alabama Accountability Act" is not innovative. It will not advance education of the state. I could have predicted this bill 35 years ago during school integration. The Act will have effects, but none of them will improve education. You know your child shows promise, but circumstances seem to conspire against putting them in a better learning environment. Then, he goes on for another two paragraphs about how we should rescue children from failing schools. Little does Del Marsh realize, he is the one who puts kids in failing schools (as we all are). Birmingham's "over the mountain schools" have world-class school systems that were explicitly created to legally avoid integration. Montgomery private schools are built for the same purpose. We have an opportunity for equality with schools, and that is with true integration. Until then, it is my belief that all plans such as the "Alabama Accountability Act" are more of the same. The competition to poor education is to move your family to a better school district. In Alabama cities a family can move 2 - 3 miles and be in another school district. Del Marsh should know. He is zoned for Anniston City Schools, but he sent his children to Oxford City Schools. Del Marsh found the competition and utilized it. In Alabama, to move your family is much cheaper than attending a private school. Often, it is a $600 rent versus $800 rent. Unlike public schools, private schools can discriminate. This discrimination is not blatant, it is disparate. They do this with entrance exams and higher tuition. All types of entrance exams have been found to be racially discriminatory. Just like the "Alabama Accountability Act", the entrance exams seem simple at face value. Only when uncovering the statistical effects, does one realize the outcome. Let's do some math on the $3500 tax credit. The tax credit is in arrears. Any parent who wishes to send their child to private schools must first pay private school tuition for one year before receiving the tax credit. The price for tuition and fees at Shades Mountain Christian School is $4,695 / year for one student plus a $500 signup fee, plus a $95 book fee. Just to get started, we are talking about $5,290 / year. The closest public transit to the school is the 31 express bus on MAX. In research, this is the average cost of the average lower level private school. 90% of Birmingham City Schools are students who received free and reduced lunch. The free and reduced lunch program is based on the federal poverty levels, which is $19,530 for a family of 3. Since 90% of Birmingham City Schools students participate in free and reduced lunch, it is a fair assumption that the average family income for a Birmingham Student is around $19,530. Assuming a standard deviation of +- $15,000, a majority of families will make less than $35,000 / year. It will not be possible for the average family to pay $1,500 up front to get started. Majority white private schools will remain majority white private schools. * Subpar private schools will spring up chasing $3,500 / student tax credit. Think for-profit colleges chasing federal govern backed student loans. These private schools will minimize costs and set a tuition cost of $3,500. * An industry for subprime high school student loans will spring up. These industries will advance families $2,000 or $2,500 with a claim on the families $3,500 tax credit. * Only people currently paying a private school bill will see a benefit. Everyone else will just incur more costs. * Set a clear mission for the Alabama School system. Teachers are trying to optimize for too many variables: college prep, paperwork, testing, teaching time, classroom time, etc. Instead of adding days, and adding responsibility -- simplify. Simplify the goal and simplify the process. * Moneyball metrics for schools. Schools have statistics on everything -- use them. Use the statistics to find kids who change patterns early. Use those statistics to intervene, and hold students accountable. * Put Superintendents back in the classroom for 7 hours per week. The unions are against this because it takes a teacher out of the class room, but who cares what the AEA says. Superintendents need to remember what teaching is like. Superintendents should be teachers first. * Measure teachers on the grades of their students for all courses the students take. Mrs. Frye told me: "There is not such thing as a math person and an English person. Anyone can do anything." Athletes are judged by a plus-minus differential while they are on the floor (i.e. when this athlete is on the floor, one with a positive differential means he increases leads). Measure teachers the same way for students across all of their courses. A math teacher should encourage English capabilities as much as math. Measure teachers on a plus-minus system across all their students in all subjects.